Our Products: 1873 Great Western II Revolvers > Dlx "Grande Californian"
GWII Deluxe "Grande Californian"- A Classy Six-Shooter! New for 2019, Early & Modern Firearms Company, Inc. is proud to introduce this new addition to our Great Western II (GWII) line of single action revolvers! Manufactured and engraved by FAP F. LLI Pietta in Italy, this beautiful piece adds a "touch of class" to our most popular model, the GWII "Californian". One look at this beauty and you cannot help but be taken back to the Wild West, a time where gamblers, outlaws, and lawmen ruled the west. Dapper men and elegant women would have proudly carried and displayed this pistol, especially in the Golden State of California. 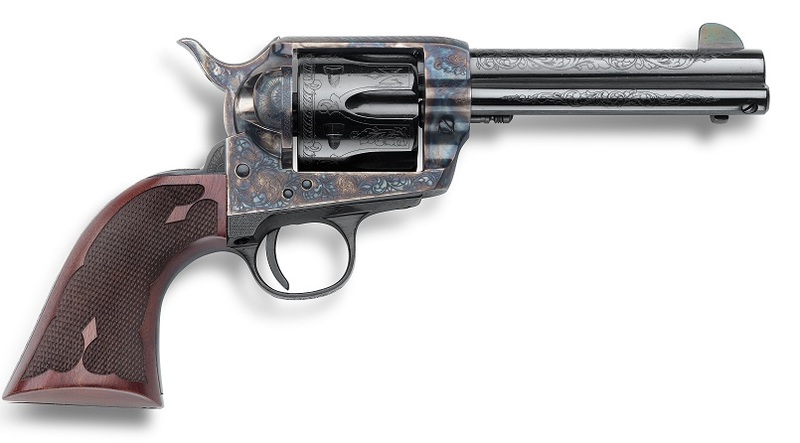 It all began in 2002, when EMF introduced the Great Western II "Californian" single action revolvers. True to the originals, with the floating firing pin in the hammer, the "Californian" models feature hammer forged steel barrels, which are high polished and blued. The CNC machined, dropforged frames are color-casehardened, in Pietta’s signature deep, rich combination of blues, browns, and purples. These frames are an improvement on the traditional casted frames of the Colt single action revolvers. The wider rear and larger front sights offer faster sight acquisition. The combination of traditional esthetics and the best modern technology made the Great Western II "Californian" the most sought after, durable, and reliable single action on the market. It has held that reputation for 17 years. The GWII Deluxe "Grande Californian" model elevates the classical beauty of the "Californian" to a completely new level! Elegantly engraved with a combination of Victorian scroll-work and sunbursts on the blued barrel and deep rich color-casehardened frame, it is accented with a one-piece diamond checkered grip. Once you see it, you just gotta have it!